We’re complicated, we have trust issues and we can just do it ourselves, anyway. Those may sound like complaints from a relationship-gone-wrong. They’re also reasons national news organizations cite for why they don’t pursue collaborations with local journalism outlets more frequently. But there are ways to tackle each one, which we will explore in this post, the third in a series of stories about national and local news partnerships. For the last several months I’ve studied national and local news partnerships on behalf of the Center for Cooperative Media, as part of a project funded by Democracy Fund and the Geraldine R. Dodge Foundation. Previous posts covered ways local and national newsrooms can partner right now and hurdles and opportunities for locals. The inclination — which is understandable — is to use your own staff and comfortable processes. But doing so misses at least two big opportunities: Expanding your reporting into areas you otherwise would miss and widening reach. But there’s a palpable mood change happening now in regard to collaboration: Leaders in national newsrooms who have historically avoided working outside their own walls are more likely to do so today, in part due to economic conditions and in part because the election showed them they may be out of touch with some parts of the country. Still, it may be hard to follow through. Schachter and I worked closely together a few years ago while at The New York Times, experimenting with regional and local partnerships (like this one involving New York City schools, this one on hyperlocal coverage in the East Village and these with partners in Chicago, San Francisco and Texas). There were a couple goals, particularly to deepen reporting in key markets and to see if we could get measurable audience improvement (in print and digitally) in those places. But there was a third, just-as-important byproduct: To learn how to partner. Schachter’s view of local-national collaboration is borne out of experience on both sides of the equation. At The Times, he had to figure out whether and how to bend the “do-it-ourselves” preference. How do you do that in a large and established newsroom? Schachter’s advice in a nutshell: “Get over yourself. … If the benefits are there, put those values higher than your stubborn adherence to the way you always do stuff,” he said. “Getting to yes” can be tricky in any partnership, but particularly exhausting when working through matrixed organizations whose cultures or processes demand lots of meetings and layers of approval. Several established organizations overcome this by tapping an individual — either as a dedicated job or an ongoing assignment — to serve as a partnership manager. As mentioned in our last post, having a lot of resources does not make a big newsroom immune to feeling the constraints of time, energy and people. A single (or initial) point of contact for collaboration can help reduce inevitable friction, particularly when relationships are just getting going. “Our philosophy is that national stories are taking place somewhere, and we want to get (the stories) in the hands of the people most affected,” Goins said. Partnership managers like Goins help turn that ambition into reality. They have the time to think through what a partnership might look like. 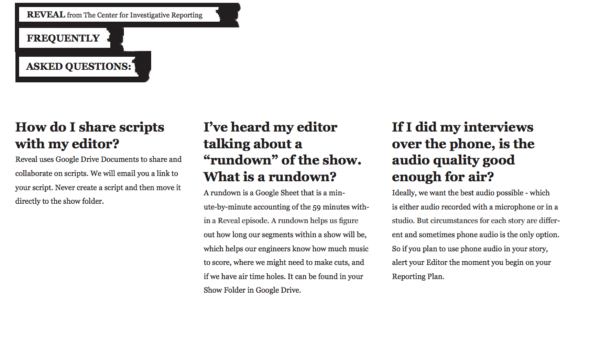 They can facilitate editor-to-editor or reporter-to-reporter relationships. They can nudge, prod and nag a little easier since everyone knows it’s their job. Over time, they become master collaborators; they understand the pitfalls to avoid, the tradeoffs to consider and the approaches that work best. Journalists at some national news organizations, without ill intent, often assume this: Smaller news organizations just aren’t as good. Size bias works both ways, of course. Journalists at small newsrooms have a tendency to assume large organizations can’t possibly have the speed and agility for a partnership to work. No amount of looking at clips and past work will overcome this. Only the act of working together can smooth that fear. Schachter said it’s critical to be open-minded about the potential in local partnerships but also open and honest about differences in quality and approach. The institutional equivalent? Avoiding collaboration out of fear of hand-holding. National partners can take some of the strain away by the aforementioned partnership manager role — again, as a specific job or part of an existing job. Another way to make life easier for you and your local counterparts: Write a partnership checklist. When I was at the Texas Tribune, we created a “director of media relations and partnerships” role, filled by the very talented Natalie Choate. Her job is to get Tribune content in the hands of local newsrooms across the state and to build ad hoc and ongoing partnerships. In her first few weeks on the job, she created a simple but powerful one-pager titled “What can the Texas Tribune do for you?” It outlines ways organizations (including, but not limited to newsrooms) could work with us: co-promotion, trial subscriptions, shared events, co-reporting, etc. It wasn’t meant to be an exhaustive list, but rather a starting point to a conversation. Bill Gray, who held a similar post at the Center for Public Integrity, found a checklist accelerated the conversation. The Center for Investigative Reporting is among the gold standards for collaboration with local newsrooms. This FAQ page is from a partnership guide for Reveal, its nationally distributed radio show and podcast. Once a partnership is established, Goins and CIR aim to make the process as easy as possible. They even share with partners a 12-page guide that outlines the process, technical specs, production tips and answers to frequently asked questions. Everyone I speak with on this subject — from the big established national newsrooms to the smallest hyperlocal sites — expresses a desire to build long-term, lasting relationships, as opposed to one-and-done projects, for obvious reasons. Why put all the time and energy into something that isn’t repeatable? Goins emphasizes the importance of building a structure for ongoing collaboration. Have a process, build trust over time and have enough people connected — “enough touch points” — so if someone leaves it doesn’t kill the partnership. During the 2016 campaign, it became clear that a story WNYC reporter Andrea Bernstein was pursuing about Hillary Clinton and 9/11 was similar to one being worked on by a Guardian reporter. They got permission to work together, and the story was published in the Guardian with co-bylines and WNYC’s audio player embedded. From a reach perspective, the collaboration was a huge success: More than 200,000 listens (more than any other co-publishing project in the WNYC newsroom’s history), 136,000 shares, 2,100 comments. “And it started at the ground level. People working together have to figure out the contours of how they work together,” Schachter said. There is an another approach that helps alleviate many of these concerns: Universal ownership or established networks. NPR and member stations, for example, have a long-established process for getting local news on national shows. NPR has regional bureau chiefs — plus topic desks for health, education, etc. — who are responsible for gathering news from across the country. Gannett’s USA Today Network, similarly, makes it easier for local news to flow up to a national desk and vice versa, and it takes on national projects that lend themselves to localization. But even in a network model, partnerships by fiat don’t work. They require trust, flexibility, and respectful working relationships. Next up: A case study, of sorts, on a partnership with lots of replicable lessons. Tim Griggs is an independent consultant and advisor to media companies (and others). He’s the former publisher of the Texas Tribune and former product and strategy executive at The New York Times. He can be reached by email (gunnertg@gmail.com) or via Twitter (@HeyTimGriggs).